Receipts are often annoying little pieces of paper that we disregard or forget about — that is, until we need to exchange an item or file expenses. Although it might take a little effort, keeping track of your receipts can help you better manage your financial life and save money. Here's how. Did you know that some retailers will offer a retroactive discount in the event you forget to use a coupon when you originally purchase? It's true. Even if you forget to use a coupon at the store, you can walk back in and ask customer service to help you. When I forgot to use a 20% off coupon for a purchase I made at Bed Bath & Beyond, I took the original receipt and coupon to the customer service desk and received a credit of the same 20% savings on a future purchase. Having this receipt handy saved me a good chunk of change. I've recently noticed that more and more restaurants and retail stores are asking customers to complete a survey in exchange for discounts or freebies. They need your feedback, and want to reward you in a small way for your help. Old Navy, for example, will offer a 10% off coupon code when you complete a survey of your store shopping experience. It takes about three minutes to fill out the survey online and you'll be given a coupon code for 10% off your entire purchase the next time you're in the store. Aside from saving money on clothes, I've received free burgers, drinks, cash, and other freebies for completing surveys that were printed on store receipts. It really does pay to keep your receipt and spend a few minutes answering the questions. We're all busy people, and this includes cashiers, which means it's highly probable that we're going to miss important savings. Whether it's us or the cashier who's in a hurry, a mistake could occur when checking out. I always keep the receipt and thoroughly glance over it before leaving the store. Sometimes an employee will forget to scan a coupon I gave them, or they might ring up an item twice. Other times, it's helpful to verify the price that was scanned versus the price displayed on the shelf. If a company has an item priced for $6, they have to sell it to you for that price, even if it's originally labeled for $20. So be sure to pay attention while checking out, or at the very least, review your receipt before leaving the store. As a freelancer myself, it's vital that I keep record of all business-related expenses and purchases throughout the year. When you're a business owner, you already have to pay your own Social Security and Medicare tax (since you don't have an employer to help split the difference) which means you'll want to get all the deductions and credits you deserve. Business trips and client meetings over coffee or lunch all count towards tax savings that can be deducted on your tax return at the end of the year. Even job hunting or moving expenses can help decrease your overall tax burden. This is likely one of the best reasons to keep a receipt, especially if it's for an electronic or gadget purchase. My husband recently upgraded his gaming computer and was able to get over $85 worth of cash rebates and gift cards because he followed the instructions for the rebate offers. Companies are usually very strict about rebates and cashback policies, so be sure you're following the directions exactly. Often you'll have to mail in the original receipt, so you'll want to make a copy of it for yourself before sending it out. Without the original receipt, most companies will not honor the rebate offer and you could be missing out on a good chunk of savings. We've established that keeping your receipts is important if you want to save more money, so how can you store them in an organized manner? The best answer is to use mobile apps to help stay organized and keep them for future reference. Shoeboxed is a comprehensive mobile app that allows you to input your receipts manually, or take a picture of the receipt digitally. You can then store the information for tracking expenses, mileage or meal reimbursements, and easily export to bookkeeping software for expense reports. If you work in sales or are someone who travels a lot for business, Expensify is exactly what you need. Their SmartScan technology easily reads and scans your receipt, which you can then categorize, tag, and save for future reference. In the event you lose your original receipt, this app then generates and IRS-guaranteed eReceipt that's good for redemption purposes. With OneReceipt you can save both physical receipts and digital ones made from online purchases that are received in your email inbox. Either take an image of your paper receipt, or forward a digital receipt for categorization and saving using your personal "@onereceipt.com" email address. Do you use your receipts to save money? What's another way to maximize your savings by keeping track of receipts? Excellent article Carrie, It's true that most of us don't keep receipts or proper records of purchasing. But actually receipts keeps you on budget, keeps you organized and can help save money whether you missed discounts on the purchase or going to file deductions at tax time. Personally I use Shoeboxed and Evernote app in my iPhone to take snapshots and keep my own notes about receipts. 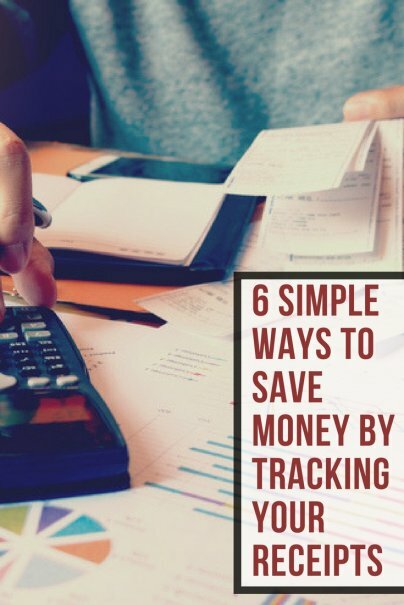 Absolutely it's important to track your receipts, and #4 really hits it on the head: if you're a small business owner or a freelancer on the side and you don't keep track of your receipts, you're literally throwing away money! I actually went and created a web app specifically for small business owners and freelancers to make it super simple to track receipts - you just take a picture with your phone camera and email it to our trained robots, who sort it and save it for later. There's no app to install, and all the data is backed up in an encrypted format on Amazon's servers, so there's no need to worry about losing your receipts if something happens to your phone. If you're interested, it's called Receiptron. Hey Carrie, great article! I started an SME about a year ago and we really struggeled with the expenses! A friend of mine told me about Xpenditure and since then everything goes much easier. I just take a picture of my receipt and it goes straight to my accountant, it's easier for me and for him! Really a recommanded tool for business owners!